It's no secret that the PS3's been hurting for good exclusives lately. Lair was a flaming wreck, and Warhawk and Heavenly Sword - while mostly excellent - were greeted with what seemed like a collective shrug from critics. A lot of heavy expectations are riding on the shoulders of Ratchet & Clank Future: Tools of Destruction, and although the game can't possibly meet them all, it certainly doesn't disappoint. First off, here's what Ratchet & Clank Future isn't: it's not a revolutionary experience that'll make Xbox 360 owners claw out their own eyes in despair. It's not a roaring justification of the high cost of owning a PS3. What it is, though, is a beautiful, relentlessly entertaining shooty-platformer, and easily the best game in the Ratchet & Clank series thus far. Considering that Ratchet & Clank practically defined platform-hopping games during the PS2 era, that's saying a lot. Fans put off by the combat-focused Ratchet: Deadlocked (Gladiator in the UK) will be glad to know that Ratchet & Clank Future marks a return to all the things that made the series great: free-roaming exploration, cinematic set-pieces and a huge variety of gadgets and explosive weaponry. Clank is back as well, returning to double duty as Ratchet's robot sidekick and propeller-equipped (or jet-equipped, if you prefer) backpack.Also returningis fast-talking idiot superhero Captain Qwark, who actually makes an effort to be somewhat helpful this time. Although the gameplay feels familiar, developer Insomniac has promised that R&C Future will leave the Ratchet universe fundamentally changed. Part of this comes through gradually revealed details about Ratchet's cat-like, mechanically inclined species, the Lombaxes, of which he's the last. As it turns out, they've apparently been wiped out by Emperor Percival Tachyon, a vicious little alien with a Napoleon complex who runs half the galaxy and wants Ratchet dead. You know, for completion's sake. If Ratchet intends to stay alive, he'll need to fight through armies of Tachyon's Drophyds (creatures that resemble oversized goldfish piloting giant robot suits), an entire armada of robot space pirates and a lot - a lot - of hostile wildlife. He'll eventually gather allies of his own, including an elf-looking explorer's daughter and her aging robot bodyguards, Cronk and Zephyr, who are patterned after the PS3 and Xbox 360, respectively. No, really. They crack jokes about it and everything. 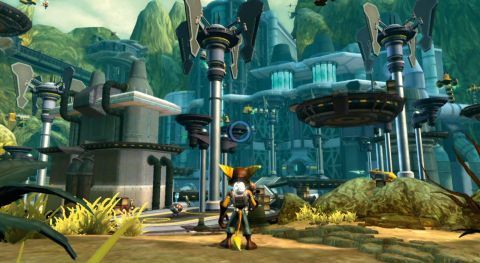 Description Get ready for more wild weapons and sci-fi tomfoolery - Ratchet and Clank have arrived on the PlayStation 3.